The first time I visited New Orleans, I didn’t know anything about the city except that it was legendary for its Mardi Gras celebrations. But the more I learned about New Orleans, the more I came to love it. The history of the city is immensely colorful and complex. New Orleans has some of the most distinctive cuisine in the United States, a well-earned reputation as a center of music and culture, and a vibrant nightlife. But what I find most interesting about the city is its rich collection of legends and myths. The best way to learn about them is to take one of numerous walking tours of the French Quarter. The French Quarter—the focal point of the city for most tourists—is a well-defined area of about 13 blocks by 7 blocks, bordered by the Mississippi River on the south. This was the original city of New Orleans, established by French settlers in 1718 and controlled by France until 1762, when it was given to Spain. The city remained under Spanish rule until the early 1800s, when it was secretly returned to France, only to be immediately turned over to the United States as part of the Louisiana Purchase. The French Quarter is so named because for many years it was the district in which the majority of the French-speaking population lived. However, much of the original city was destroyed by massive fires in 1788 and 1794. Since Spain was in control during that time, the new buildings for the most part reflected Spanish architecture, and that is what survives today as the French Quarter. Most buildings are only three or four stories high. Wrought-iron balconies extend over sidewalks in the business district, and louvered shutters cover most windows and doors. 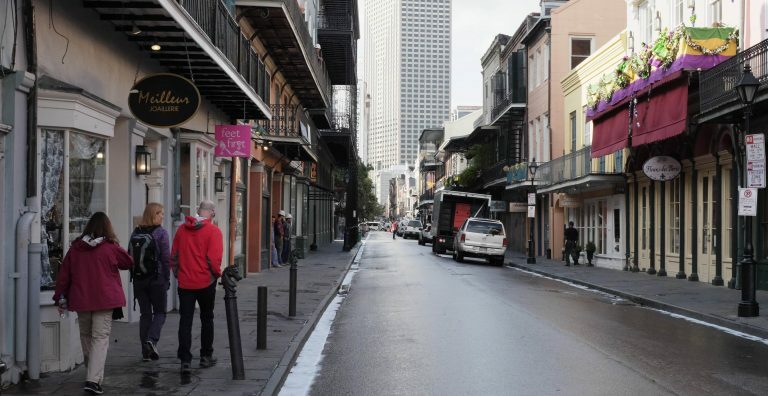 The French Quarter has the feeling of being very old—for a North American city—largely because of strict construction rules designed to protect the historical character of the buildings. But it’s not just the old buildings that give the French Quarter its unique vibe. The traffic usually consists more of pedestrians and horses than cars. Every other door seems to lead to a restaurant or bar, and people walking down the street without a beer or margarita in their hands seem out of place. You never have to walk more than a few blocks to find a voodoo shop, antique store, or “gentlemen’s” club. As I was wandering around the French Quarter during my first visit to New Orleans, I kept seeing signs and brochures for walking tours—particularly “ghost” tours. I thought a tour might be a good way to get to know a bit about the city, and I was curious about the whole ghost angle. So I showed up at the designated location one evening, paid my US$15, and set out with a guide and about a dozen other tourists to see what mysteries we could uncover. We visited a number of historical sites and heard about the many groups of people who shaped the city’s culture: the French and Spanish, Cajuns, Creoles, and free people of color. But New Orleans has also been a hangout for pirates, slave traders, and rogues of all stripes. As a result, a great many gruesome murders have taken place in the city, not to mention infamous suicides, executions, and deaths caused by the great fires. So it’s little surprise that many of the buildings in the French Quarter are said to be haunted. Plenty of companies offer walking tours of the French Quarter, each with its own twist. Some are highly theatrical, with tour guides dressed as pirates or vampires; others offer a more conservative approach that emphasizes historical accuracy. There are ghost tours, vampire tours, witchcraft and voodoo tours, cemetery tours, and so on. There are also walking tours of the city’s Garden District across town, where the main attractions are lavish houses and beautiful landscaping. I’ve taken perhaps half a dozen different walking tours in New Orleans. Some were better than others, and there were certainly instances of overlap and contradiction. But judging by the number of interesting things encountered per hour (or per dollar), walking tours are the perfect way to combine education and entertainment as you explore New Orleans.>NewOrleansOnline. Note: This is an updated version of an article that originally appeared on Interesting Thing of the Day on May 17, 2003, and again in a slightly revised form on November 16, 2004.